You can create maps in Tableau Desktop that show quantitative values, similar to the example below. These types of maps are called proportional symbol maps. 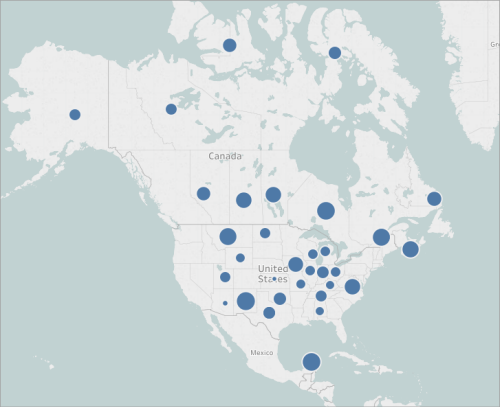 Proportional symbol maps are great for showing quantitative values for individual locations. They can show one or two quantitative values per location (one value encoded with size, and, if necessary, another encoded with color). 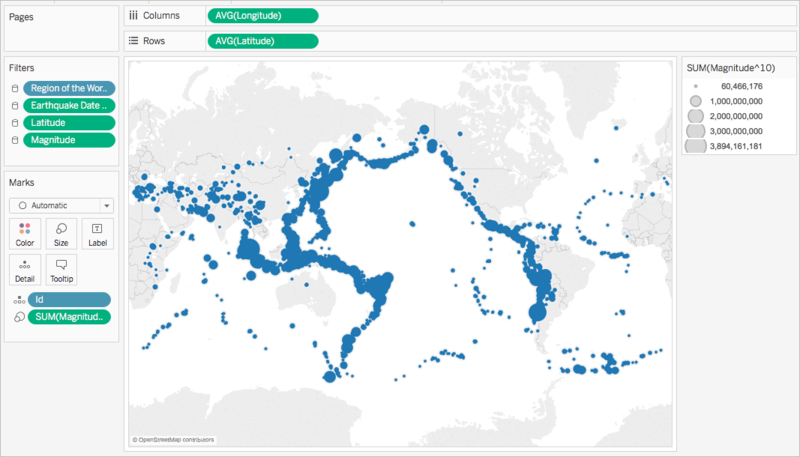 For example, you can plot earthquakes recorded between 1981 to 2014 around the world, and size them by magnitude. You can also color the data points by magnitude for additional visual detail. This topic illustrates how to create a proportional symbol map using an example. Follow the example below to learn how to set up your data source, and build the view for a proportional symbol map. It's also recommended that your data contain a large variation of values, otherwise your symbols will appear approximately the same size in the view. 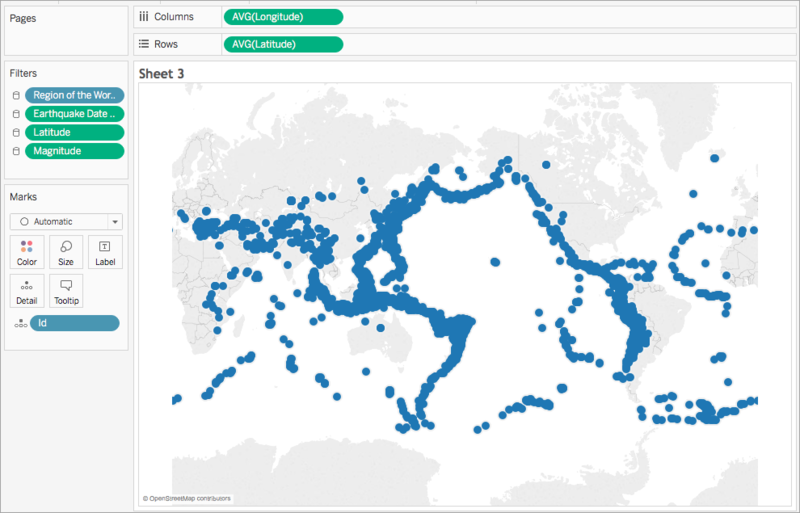 The following table is a snippet of the Earthquake data source, which is included in the Create Proportional Symbol Maps in Tableau Example Workbook on Tableau Public. It contains columns for earthquake magnitude and magnitude to the power of ten, and columns for latitude and longitude vales. It also contains a column for the date and earthquake ID for added clarity and organization. To follow along with this example, download the Create Proportional Symbol Maps in Tableau Example Workbook from Tableau Public, and open it in Tableau Desktop. In the Data pane, under Measures, double-click Latitude and Longitude. Latitude is added to the Rows shelf, and Longitude is added to the Columns shelf. A map view with one data point is created. From Dimensions, drag ID to Detail on the Marks card. If a warning dialog appears, click Add all members. A lower level of detail is added to the view. From Measures, drag Magnitude^10 to Size on the Marks card. Note that the Magnitude^10 field is used to encode size, instead of the Magnitude field. This is because Magnitude^10 contains a wider range of values, so the differences between values can be seen visually. You now have a proportional symbol map. 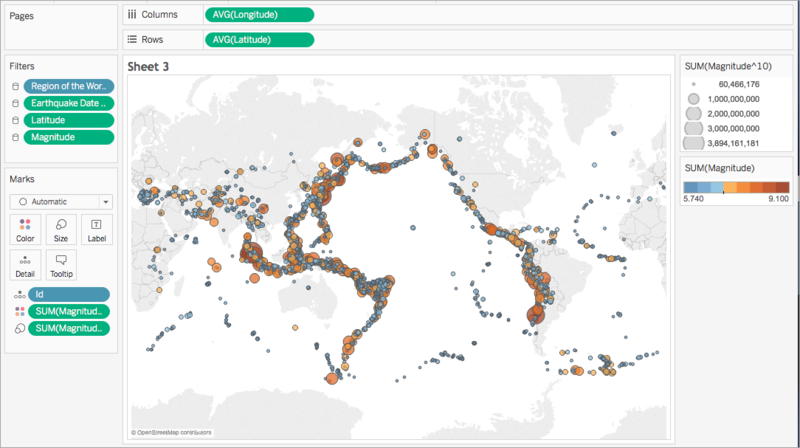 The larger data points represent earthquakes with larger magnitudes, and the smaller data points represent earthquakes with smaller magnitudes. In most cases, this is as far as you need to go to show quantitative values for single locations. However, in this case, since there are so many data points in the view, more visual detail is needed to help you differentiate between the earthquake magnitudes, and to help you spot any trends. From Measures, drag Magnitude to Color on the Marks card. Click the color drop-down and select the Orange-Blue Diverging palette from the list. Select Stepped Color, and then enter 8. This creates eight colors: four shades of orange, and four shades of blue. This reverses the palette so that orange represents a higher magnitude than blue. Click Advanced, select Center, and then enter 7. This shifts the color palette and ensures that any earthquake over 7.0 magnitude will appear orange in color, and any earthquake under 7.0 magnitude will appear blue in color. Under Effects, click the Border drop-down menu and select a dark blue border color. The map view updates with new colors. 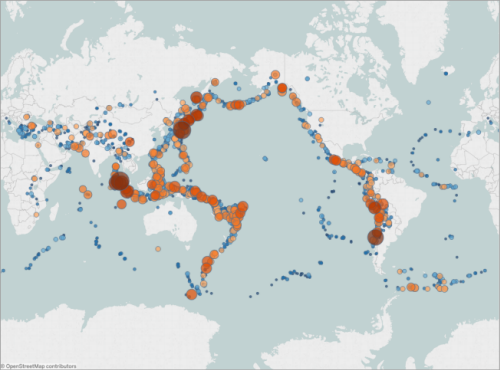 The dark orange data points represent earthquakes with higher magnitudes, while the dark blue data points represent earthquakes with lower magnitudes. The opacity of the marks is at 70% so you can see where the data points overlap. On the Marks card, right-click the ID field and select Sort. For Sort Order, select Descending. For Sort By, select Field, and then click the drop-down and select Magnitude. This sorts the data points in the view so that the larger magnitudes appear on top. Your proportional symbol map is now complete. In this particular case, it could be very easy to interpret the size of these data points as representing the actual ground area of the craters. Your audience might assume that most of Montana, U.S. was destroyed by a crater, which is not accurate. In reality, the crater in Montana was simply one of the larger craters in the data source and has been sized accordingly. In cases such as these, it might be helpful to include annotations, or explanations of what the size actually represents to avoid misinterpretations. Even if it seems obvious.